Register for free diabetes education classes. GBMC offers a series of two 90-minute classes in its primary care offices: Diabetes Basics and Taking Charge of Your Diabetes. Both include education, support and resources. Learn how to manage your meals, understand target blood glucose numbers and become comfortable self-monitoring. To sign up, call your PCP's office and request to speak with the RN Care Manager. 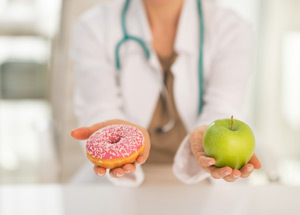 For qualifying patients, GBMC also offers one-on-one sessions with a registered dietitian who is also a certified diabetes educator at these practices: Hunt Valley, Family Care Associates, Hunt Manor, Owings Mills, Joppa Road and Internal Medicine Residents. If you are interested in diabetes education, call the Nurse Care Manager at your primary care practice. Feel free to forward this e-mail to a friend or family member who might need help managing their A1C level, too. 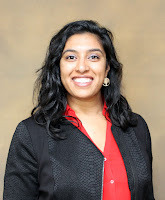 In need of a primary care provider? Find one near you. Q: What is the number one precaution I should take when traveling? A: Hand washing cannot be emphasized enough; it’s like a do-it yourself vaccine! Lather with water for at least 20 seconds (about one Happy Birthday song) and dry with a clean towel. Wash before eating, before and after treating a cut or wound, after using the toilet, after touching an animal or garbage and after changing diapers. Avoid those who are coughing and sneezing, and if you must cough or sneeze, do so into your shirt sleeve or elbow, not hand. Q: What are some good items to pack? A: Pack full-sized bottles of sunscreen and insect repellent, especially if visiting a tropical location. Use products with 25 percent DEET; you don’t need more than that. Apply sunscreen first, and then insect repellent. Also bring hand sanitizer or dissolvable soap, which does not require water to rinse off. Oral rehydration salts can come in handy for people who become dehydrated due to traveler’s diarrhea or vomiting. Bring along 1% hydrocortisone cream; it is helpful for a variety of skin conditions from insect bites and poison ivy to allergies, rashes and overall itchiness. Keep your prescription medications in your carry-on luggage and bring extra just in case. If you have any chronic illnesses, carry a card that identifies, in the local language, your blood type, medical conditions, medicines you take, and any allergies you have. Wear a MedicAlert bracelet if you have serious medical conditions. Q: Are there foods or drinks I should avoid? A: If you are traveling abroad to places like Africa, Asia or South America, do not drink the tap water. Brush your teeth with bottled water. Avoid eating raw fruits or vegetables unless they have a thick peel, like a banana or orange. In all locations, be wary of food served at room temperature, raw or soft-cooked eggs, raw or undercooked meat or fish, unpasteurized dairy and wild game. Q: Should my family be vaccinated before we travel abroad? A: Visit a travel clinic 6-8 weeks prior to traveling and bring along your vaccination history, a detailed itinerary and your travel dates. They will be able to give you reliable advice on recommended vaccines. Some vaccines and malaria prevention tablets must be started weeks prior to travel, so be sure to plan in advance. For the most up-to-date, reliable travel alerts for every country, visit the Centers for Disease Control and Prevention website at http://www.cdc.gov/. Q: What should I do if I think one of my family members has contracted a disease? A: Seek medical attention immediately. Hydration is usually a good first step. Find a safe and reliable doctor who speaks your language by contacting the US embassy in your destination country (http://www.usembassy.gov). Upon returning home, make an appointment with a primary care physician, who will assess your symptoms and determine whether a referral to an infectious disease specialist is necessary. To learn more about infectious diseases and primary care at GBMC, visit www.gbmc.org/infectiousdiseases and www.mygbmcdoctor.com or call 443-849-GBMC (4262). Migraines are often perceived as simply bad headaches but in actuality, more than 37 million Americans are suffering from a debilitating condition that can't always be handled with a dose of Tylenol. Though migraines are a type of headache, they are more severe and can be accompanied by nausea, vomiting, tingling, stroke-like symptoms and sensitivity to light and sound. 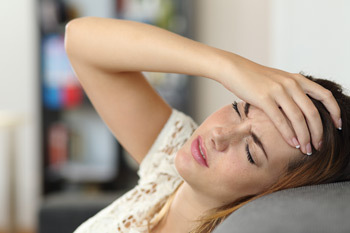 Sometimes a migraine phenomenon can even occur without a headache. According to GBMC neurologist Arash Taavoni, DO, identifying one's migraine triggers is the key to preventing them. He recommends that patients log their food, stress levels and sleep, along with other environmental factors, like weather conditions and barometric pressure, in an effort to find patterns. There are even mobile phone apps, such as MigraineBuddy, that can be useful in helping patients log their migraine symptoms, frequency, duration and intensity by automatically making data correlations to pinpoint a migraine's cause. Some of the most common food-related triggers are caffeine and MSG, which is often found in highly-processed and convenience foods, so establishing a healthy diet is the first step to addressing migraines. In addition to lifestyle and behavioral factors, genetics and hormones can make certain people more prone to migraines; they can run in families and are more common among women. While identifying triggers as a means of trying to avoid migraines is ideal, sometimes this isn't enough and other treatments may be needed. There are two types of medications that can be prescribed – preventive and abortive. Other than pills, there are also intranasal and injectable medications for faster relief. There are even treatments without medications, such as headband-like devices patients can wear at home that use electrical impulses or magnets to reduce migraines by acting on the nerves associated with head/face pain. Dr. Taavoni notes that acupuncture may be helpful as a complementary treatment, as well. Some patients with chronic migraines who have not had adequate success with medications and lifestyle modifications could be candidates for Botox® injections. "To prevent migraines, Botox® is injected into 31 specific spots on the head and shoulders, administered every three months by a trained physician," Dr. Taavoni says. If you're suffering from migraine headaches, your primary care physician can likely help you find a solution. If migraines are frequent and refractory or if there are additional neurological symptoms, you should see a neurologist: http://www.gbmc.org/neurology. If you've exercised on a treadmill through the cold winter and rainy spring, an outdoor summer run can seem so appealing. Running outdoors is a great way to mix up your fitness routine while getting a boost of vitamin D; the varied terrain activates different muscles, but it's important to be aware of how the heat and humidity can affect your physical abilities. A relative humidity of 60% or more hampers sweat evaporation, which hinders your body's ability to cool itself. Heat-related illnesses, such as heat cramps, heat exhaustion and heat stroke are all real possibilities for children, the elderly and particularly for outdoor runners, according to Mark Lamos, MD, Medical Director of Greater Baltimore Health Alliance (GBHA) and Internal Medicine physician at GBMC. Heat cramps: If you're sweating a lot, you're losing salt, water and electrolytes as you exercise; this can cause painful and involuntary muscle spasms in the arms, calves and abdomen. 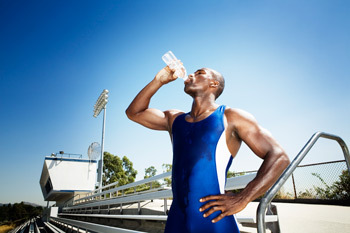 Hydrate immediately with water or electrolyte-infused sports drinks or tablets. Heat exhaustion: Severe water and/or salt depletion can lead to weakness, excessive thirst, headache, loss of consciousness, nausea, vomiting and dizziness. Heat exhaustion can also involve heat cramps. Drink plenty of fluids (not caffeine or alcohol), remove tight clothing and take a cool shower or bath. If cooling measures fail to provide relief after 15 minutes, get medical help. Heatstroke: The most severe of heat-related illnesses, heatstroke can be life-threatening if left untreated. It causes the body's internal temperature to climb beyond 104 degrees, and the body loses its natural ability to cool off. Someone suffering from heatstroke may also have an altered mental state, throbbing headache, high temperature, rapid pulse and lose consciousness. Seek medical attention immediately while simultaneously cooling the body as quickly as possible with water and ice packs. Stay hydrated. Run in public parks or on trails that have water fountains. If you'd rather go your own way, bring a bottle of water or wear a hydration pack, like a Camelbak. Make a plan. Avoid exercising outside when the sun is at its most intense, between 10 a.m. and 2 p.m. Plan routes that are well-shaded or have cool areas where you can take a break if needed. Be prepared. Wear loose-fitting, light-colored, breathable clothing (like cotton) and a hat. Apply sunscreen generously at least 30 minutes before sun exposure, even if it is an overcast day. Before exercising in the heat, talk to your doctor about the medications you are taking and how they may affect your tolerance of heat. GBMC primary care offices have extended and weekend hours to accommodate busy schedules. If you don't have a primary care physician, find one today at www.mygbmcdoctor.com. Preheat oven to 400°F. Place a large baking sheet in the oven to preheat for about 10 minutes. Heat garlic with cooking spray in a medium-size pan over medium heat. Cook until soft, but not browned. Add onions, and continue to cook until the onions are soft, but not browned. Add spinach and toss gently. Cook until the spinach is heated throughout. Season with pepper and set aside to cool. 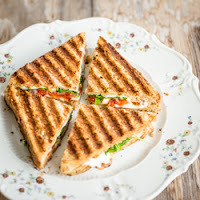 When the spinach and onions are cool, assemble each sandwich with one slice of bread on the bottom, one tomato slice, ½ cup of spinach mixture, ¼ cup of cheese, and a second slice of bread on the top. Spray the preheated, nonstick baking sheet with cooking spray. Place the sandwiches on the baking sheet. Bake for 10 minutes, or until the bottom of each sandwich is browned. Carefully flip sandwiches and bake for an additional 5 minutes, or until both sides are browned. Serve immediately.